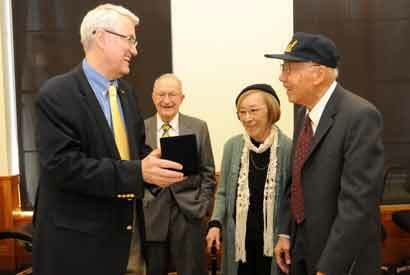 “I can’t think of any better place to send (the medal) to than this university,” Sayama said after the ceremony. He noted that he spent many hours at the Bancroft, including on the day he was scheduled to take his Ph.D. oral exams. He said he got so involved in his studies that he forgot the exam until someone asked him about it that night. Fortunately, he said, his professors allowed him to reschedule. Friday’s ceremony was attended by Sayama family members and Bancroft staff, including Bancroft Director Elaine Tennant and Theresa Salazar, curator of Bancroft’s Western Americana Collection. That collection includes the U.S. government’s Japanese American Evacuation and Resettlement records from World War II, which are supplemented by personal papers from Japanese Americans in wartime internment camps. The materials, along with those from seven other institutions, can be found in the online Japanese American Relocation Digital Archives. 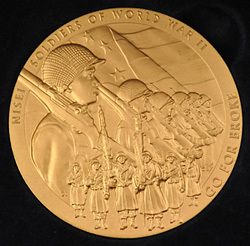 Last November, Sayama was among dozens of Japanese-American World War II veterans who received the medal in Washington, D.C. That medal and the Presidential Medal of Freedom are the nation’s highest civilian honors. Chancellor Birgeneau accepts the Congressional Gold Medal from Kenji Sayama and his wife, Sue. John “Jack” Rosteon, Class of ’42, looks on. Photo by Peg Skorpinski. During his internment, Sayama enlisted in the U.S. Army and served four years. His time was split between officers’ and Military Intelligence Service training in the United States, and service in Japan. Later, Sayama returned to UC Berkeley on the G.I. Bill, receiving a master’s degree in 1950 and a Ph.D. in 1953, both in zoology.